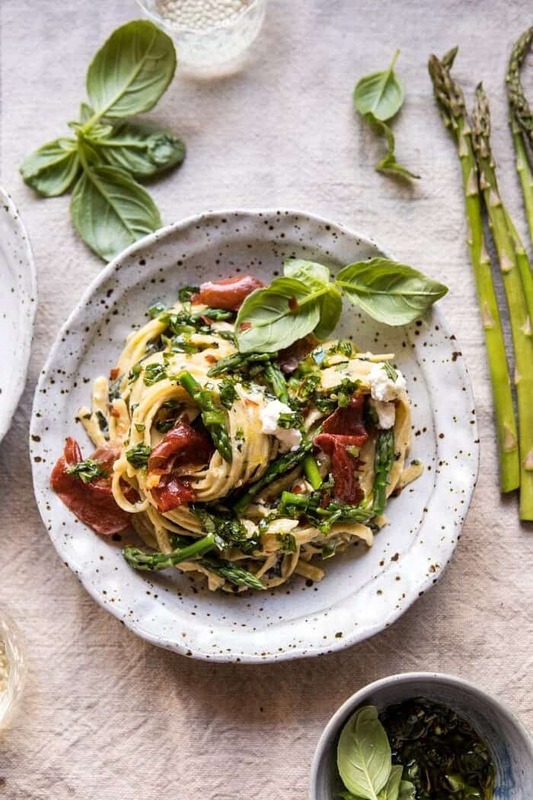 Wednesday needs this Spicy Pesto, Asparagus, and Ricotta Pasta with Crispy Prosciutto. But then, I do believe that everyone needs a bowl of pasta at least once a week, just to keep your sanity. 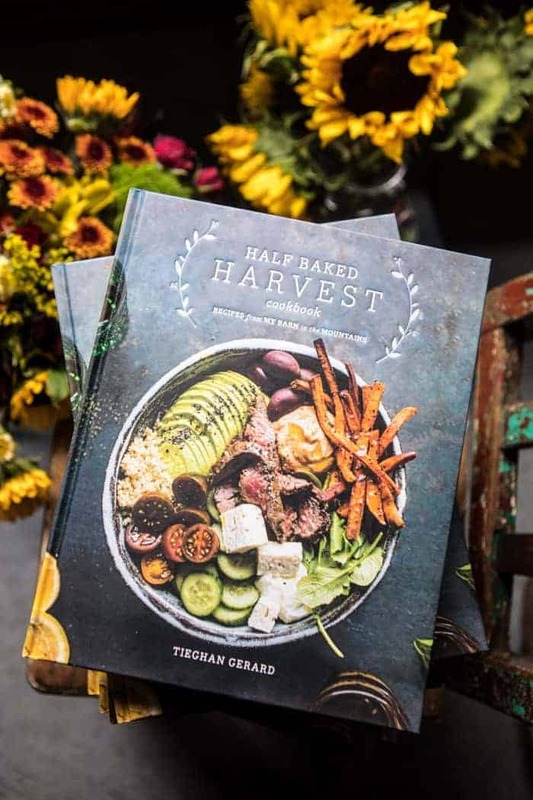 I’m one of those people who truly believes in carbs, which I’m sure you guys already knew by the amount of pizza, pasta, and rice recipes here on HBH. Yes, I do love my carbs, cheese and greens. They’re actually my favorite combo. 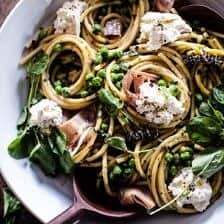 OK. It’s been a minute since we chatted all things pasta (ahh it’s been like ten days, but whatever) and I have been dying to share this recipe with you guys all month long. I am really, really into super fast, use what you have on hand, recipes at the moment. Think pantry staple recipes with a touch of freshness from whatever greens are currently in your fridge. 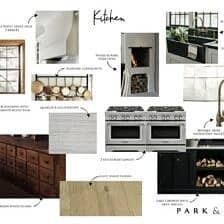 It’s weird, I go through phases of wanting to spend hours and hours in the kitchen working on more complicated recipes, but then I also have phases when I just really don’t feel like being in the kitchen long at all. 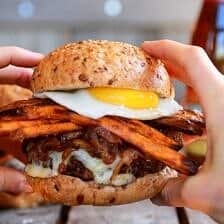 Right now, all I want are fast and easy recipes. I think this is partly because I know this is what you guys need and want. But it’s also because I just have a lot going on with work, and therefore, a lot more things to be working on. So quick recipes it is! All is good though, because I love a good challenge and I’m having fun getting creative to keep these quicker, easier recipes colorful and tasting delicious. And that is where this pasta came into play. Not going to deny that the first version of this pasta was just plain boring. So boring. I hated it and there was no way I was going to post it. Sure, it tasted fine, but I have high standards, and well, fine doesn’t cut it for me. Quick note, I hate the word fine. My mom knows that telling me something is fine will mean it gets the axe! When someone says something is fine, that’s no bueno in my mind. Also, I do love the word no bueno. I use it often. So I went back to the drawing board, also known as my notebook, pondered a few things, reworked the recipe, and came out with this delicious bowl that’s packed with flavor, but still uses a very minimal ingredient list. 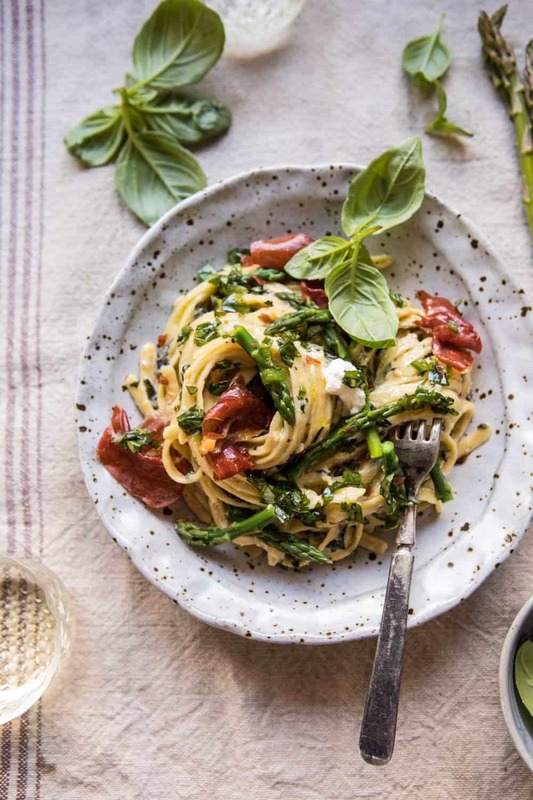 All you need for this pasta is some basil pesto (this is my favorite homemade pesto, bonus that it’s also loaded with kale), some jalapeño, asparagus, lots of lemon, lots of ricotta, and prosciutto. Nothing too fancy, but put it all together and you have something pretty delicious. My trick to keep this quick cooking? Cooking the asparagus with the pasta. Adding the asparagus to the boiling pasta water, saves you not only time, but also leaves you with one less dirty dish to clean. Yes, please! 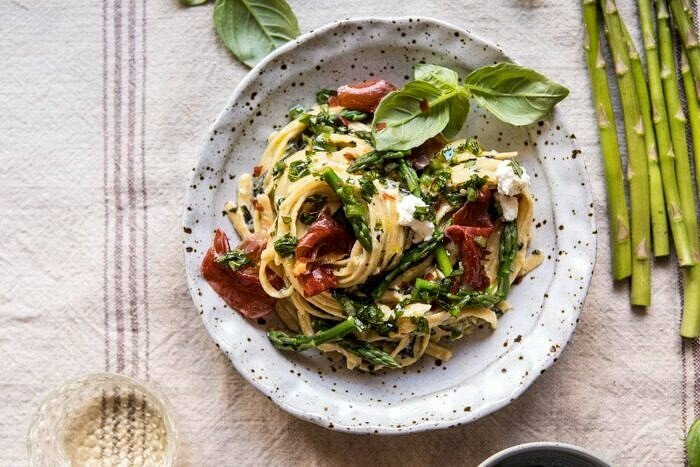 Once you have your pasta and asparagus cooked, it’s just a matter of tossing it all together and finishing the bowls off with crispy prosciutto, which in my opinion just makes everything better. What also makes everything better? A bowl of this pasta and rewatching The Parent Trap (the one with Lindsey Lohan) with the best little sister by my side. Oh, and after the pasta, grabbing a couple Oreo’s…and a jar of peanut butter. Let me explain. Asher watched the Parent Trap for the first time over the weekend and she learned about dipping Oreos in peanut butter. YES. You guys know this scene, right? It’s my favorite, and if I was a kid and didn’t have a clue that Oreos are maybe not the best choice for a snack, I’d probably still be dipping them right into my peanut butter. The best. Can I go back to being nine years old now, please? Serious Question: did you (or do you?) dip your Oreos in peanut butter? OK. And with that little story I am ending my rambles. Let’s do Wednesday night pasta with all the greens. YUM. Made in under 30 mins, is super easy, creates very few dirty dishes, uses minimal ingredients, yet is packed with flavor. Doesn't get much better than that! 2. Arrange the prosciutto in an even layer on the prepared baking sheet. Transfer to the oven and bake 8-10 minutes or until crisp. 3. Bring a large pot of salted water to a boil and boil the pasta to al dente according to package directions. 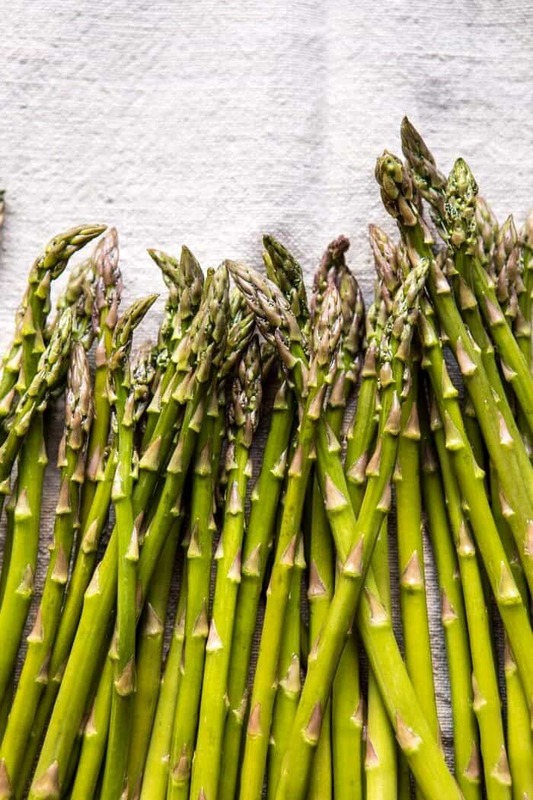 During the last 2-3 minutes of cooking, add the asparagus to the water. Reserve 1 cup of the pasta cooking water and then drain. 4. 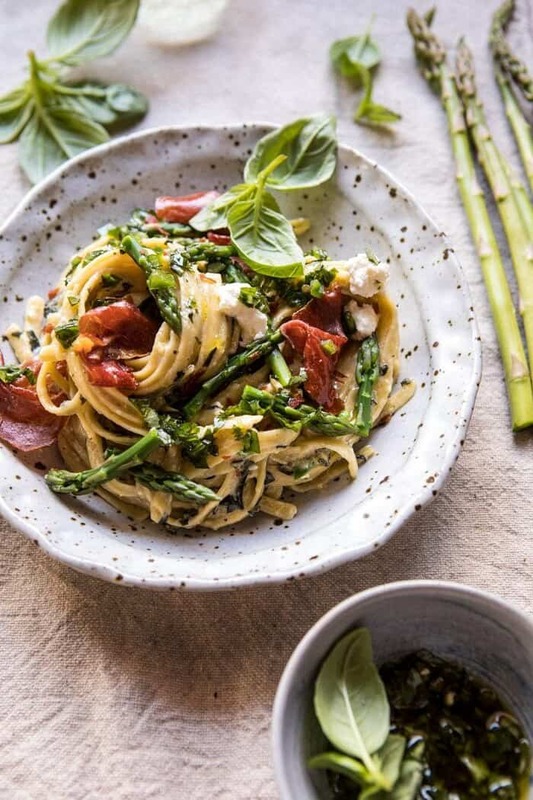 Toss the hot pasta and asparagus with the pesto, jalapeño, ricotta, lemon zest, juice, and enough of the pasta cooking water to create a sauce. Taste and season with salt and pepper. 5. Divide the pasta among plates. Serve topped with crispy prosciutto, chives and parmesan. Enjoy! 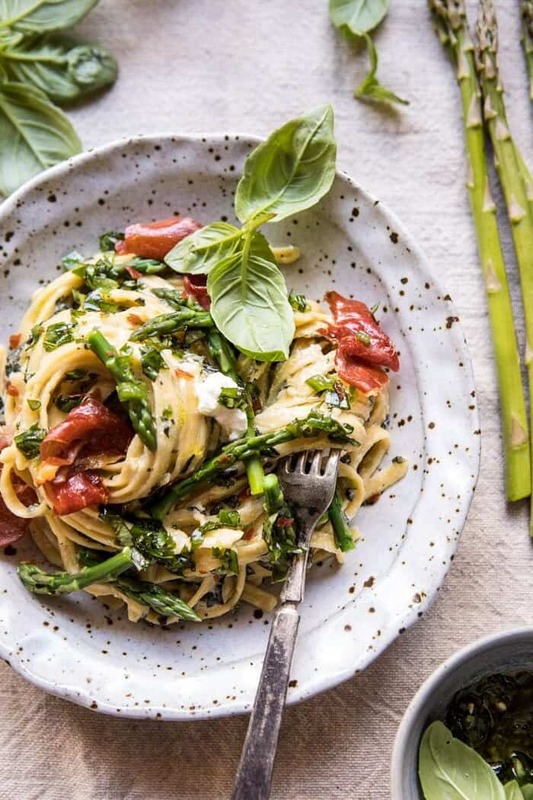 And for real, the greens make this pasta healthy food. It’s true. 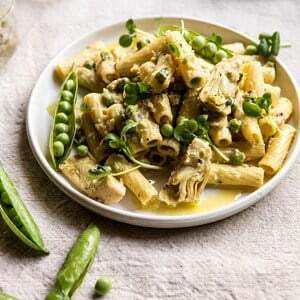 30 Minute Artichoke and Pea Rigatoni Pasta. Bummer! Well, when you do I hope you make this! Thanks Ruth! OOPS, SOMEONE FORGOT THE PROSCIUTTO MAYBE. Hi Jim! Its in the ingredients. Is that what you’re talking about? Thank you! 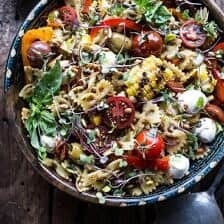 This sounds amazing and I am in love with the serving bowl! It’s beautiful 🙂 I love making quick “clear out your pantry” recipes too! It’s a great way to make sure you don’t have too much food waste too. I’m pretty much ready to eat anything with ricotta cheese in in it. And prosciutto. YUM. Definitely on the weekend try list with home made ricotta. I use the same method for cooking grape tomatoes, just drop them in the pot of water for less than a minute at the end. Its the best! I hope you love this Terri! Thanks! Perfect! I hope you love this Kristina! Thank you!! This recipe is to die for! I completely get the need for easy and simple sometimes. The colors of this dish make it so appealing and the ingredients have got to make it so appetizing. Definitely want to try it. Thanks for posting. Thank you Kristy! I hope you love this! Agreed, I would die without carbs! I just bought ricotta, so I’ll be making this soon! Perfect! I hope you love this Christina! That’s nice that you and Asher saw the parent trap and I remember watching it in the car with my sister when we were young and she started doing the Oreo thing. I don’t eat Oreos but my step dad loves them with milk! I hope you’re having a good week and I’m looking forward to tomorrow’s post! Hi Kristin! I am so glad you like this recipe and hope you love it when you try it! Love the Oreo thing! Thank you! 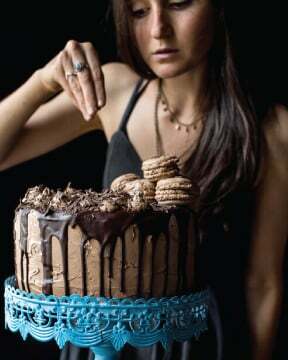 I want to make this tomorrow night but am I crazy or is this missing a step?! What do I do with the prosciutto once it’s out of the oven? I’ve loved all of the books in this series, but Gaslight was brilliant and the insight into Christian Poe and our heroine Raven Black pulled at my heartstrings, made me laugh aloud, shudder in acknowledgment and love the feck out of them! 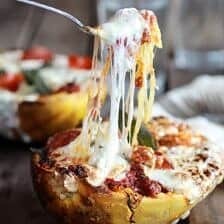 This looks delicious but I will have to come with an alternative to the Ricotta cheese. I really don’t like it. I hope you love this when you try it, Mark! Thanks! Hi Tieghan! 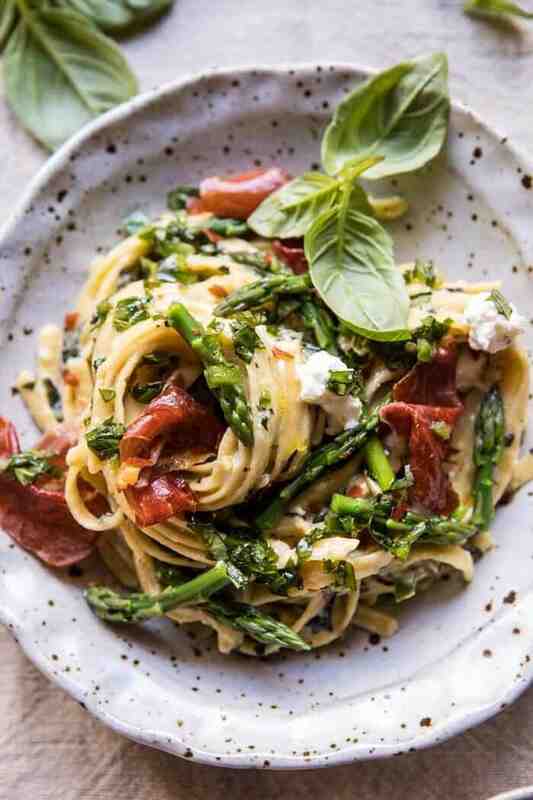 I made your spicy pesto, asparagus, and ricotta pasta with crispy prosciutto for dinner tonight. It was like Spring on a plate! 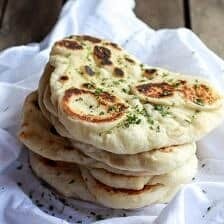 Easy and quick to prepare and the flavours were out of this world! I love your site. Thank you!! I am so glad you loved this! I hope you have a great weekend! 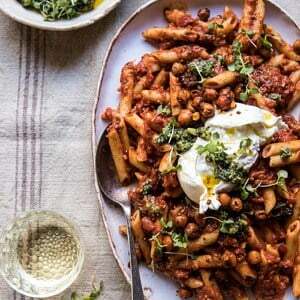 I don’t normally comment on recipes, but oh my, this is so delicious! I had leftovers for lunch and topped it with a poached egg. A match made in heaven! Yum!! I am so glad you loved this Pamela! Thank you!! This looks seriously delicious. I intend to make it Monday. However I made your homemade pesto for a pasta salad just now and it is the best pesto I have ever tasted. It is so good. Thank you. I hope you love this Marcia! Thank you! WOW! This was absolutely delicious! I made this as an appetizer for Easter & it was so easy and perfect. I wish I had made it for the main course. The lemony flavor added the perfect touch and I topped it with toasted pine nuts. Wonderful! It’s snowing here in Midwest 😭 So unusual for us! This turned my mood downside up 🙂 Found lemon pappardelle pasta at Trader Joe’s, really made this dish pop!!! Thank you for sharing! I’ve been trying to cook well for years and ever since I made the French Scallops from your cookbook I’ve been making one recipe after another. Every one a success! My family is so grateful, too!!! Cheers! I am so glad you enjoyed this and other recipes Whitney! Thank you so much! I can say there is nothing better than this. This super easy dish can delight my friends and family. I can bet the taste would be toothsome. Thanks for sharing ingredients. I am so glad you, your husband and your 2 year old loved this Kristen! Thank you so much! I hope you continue to enjoy other recipes as well! I am so glad you loved this Ale! Thank you so much! With asparagus on super-sale last week, I knew I needed to give this a try. So very easy; I had the pesto mix ready to go long before the water came to a boil. Wasn’t that spicy, but I may have had a mild jalapeno since their heat varies. I also had some extra fresh spinach that I stirred in to add some more green. Looking forward to this as leftovers this week. I am so glad you loved this Rachel! Thank you so much! Smells good. I’ll be making this soon! I made this & it was delicious! I made mine with Zucchini & Cucumber as the noodles & had less basil pesto than what was called for. Only thing I would change the next time I make this dish is to use less ricotta cheese. It completely took over the whole dish & it was too creamy. I like to taste more vegetables than sauce in most dishes. Just needs tweaking to fit what we like in our home, but wow what a great recipe! All vegetables & even my Fiance approved!! Thank you so much Sarah! I am so glad you liked this! 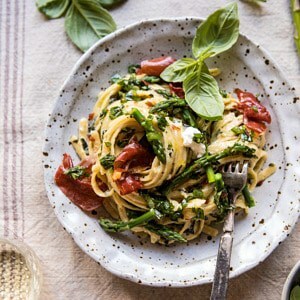 Can’t wait to make this tonight with the fresh asparagus cut from my garden. If only I could grow prosciutto. Haha right?! I hope you love this Cassie! Thank you! Made this tonight! So quick, easy and fresh. I have never made pesto before and it was so simple to make. Looking forward to leftovers at lunch tomorrow. Just tried this for dinner and it is FABULOUS! It was such a good combination of flavors and the prosciutto gave it the perfect crunch. Yummy! Thank you! I hope this turns out amazing for you!